The South Miami Hospital Twilight 5K is a race and block party rolled into one. The course winds through the quiet South Miami neighborhood adjacent to FootWorks, then ends near Town Kitchen & Bar at a block party with music, food, Concrete Beach beer (for 21 and older), kids zone, kiddie dash, and souvenir shirts in all sizes to fit the kids, mom, and even dad. Souvenir Gender Specific Tech Shirt for the first 1,500 who register for the 5K and access to Post-Race Celebration. Kiddie Dashers get a unisex youth sized cotton tee. Register by Friday May 3 and your bib will be personalized with your name! Starts at 6:00pm. Run through the quiet and beautiful South Miami neighborhood, ending near FootWorks. Click HERE to view and print a Course Map. 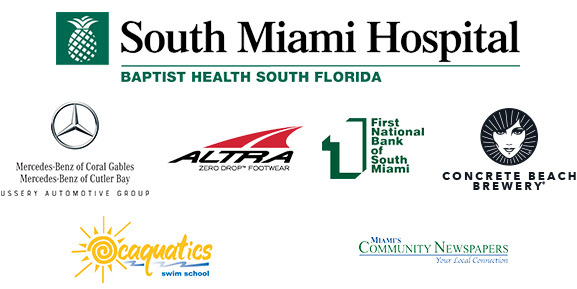 The top male and female finishers at the South Miami Hospital Twilight 5K plus the winner in each age group will each receive Altra Running Shoes valued at $90 to $130! 2nd and 3rd place age groupers receive a $30 and $20 FootWorks Giftcard respectively. Enter the Taste of SoMi Village after the race to sample lite bites from local restaurants. The list below is not comprehensive and is subject to change without notice. Packets will be available starting at 5:00p.m. on Monday May 27 until 3:00pm Sunday June 2 at FootWorks in South Miami (5724 Sunset Drive). Then around the corner at the race site starting at 4pm. The Kiddie Dash begins after the finish of the 5K. Kids will line up at the finish line in their age groups: 2-3 yrs. run 100 ft, 4-5 yrs. run 200 ft, 6-7 yrs run 400ft, and 8-9 yrs run 800 ft. Entry fee includes a cotton t-shirt in youth sizes, medal, and special fun zone including inflatables and arts & crafts. Pick up your shirt during Packet Pickup or at the Race Site on Race Day starting at 4pm. Click to view the printable application. Race Management reserves the right to postpone or cancel the event due to events out of Management’s control such as a natural disaster or other emergencies. No refunds will be issued under these circumstances. Management may also alter the course and distances for the safety of the athletes. There will be medals for all finishers? Hello Fede, not this year. Sorry, just got back from cleaning up after the event last night. Hope you had a nice time and found a convenient place to park. When will the 2016 Twilight Run photos be posted? We are working to edit all the photos down and put them in order. Should have them posted today (5/19) or tomorrow (5/20). Hello Carlos! The South Miami Metrorail station is blocks from the race. You can take that from Downtown Miami. We haven’t determined if there will be finisher medals. How are the proceeds from this 2017 5K event going to be distributed? Hi! I just registered me and my husband at the same time for the 5k but forgot to add him to my team. How can I add him? You would do it right here but registration isn’t open yet. Registration will open in February. what Times are the races? Can my son do the dash and then we can do the 5k? Hello! The 5K is at 6pm. The kid dash begins at approximately 7pm/7:15pm. Hello, I have registered my entire family for the 2018 Twilight Run however, I got some of the shirt sizes wrong when registering, is there someone or some way I can change the sizes of the shirts? When can I register for the 2019 Run? Hello Julio! We open registration in the Spring with a special price for the early birds. You can click the Subscribe button on the sidebar to be notified when we open. I require information about sponsorship of this event. How much is cost it? Thanks! Hello Eluz! Please email eddie@teamfootworks.org for information. Where can I call to upgrade a registration? Good morning, Will there be medals this year?